A Tentative Syntax of Modern Indo-European (MAR 2013): it complements, improves and corrects the Syntax section, as well as some aspects of the sections on Morphology. Late Proto-Indo-European Etymological Lexicon (MAY 2017): it corrects and improves the appendix on Late Proto-Indo-European lexicon. Indo-European demic diffusion model (JUN 2017): it corrects and improves the introduction to the Proto-Indo-European Urheimat and early Indo-European dialects. of areas of confusion and difficulty. It also contains an extensive English – Indo-European, Indo-European – English vocabulary, as well as detailed etymological notes, designed to provide readers with an easy access to the information they require. An essential reference source for the student of Indo-European as a learned and living language, this work will appeal to students of languages, classics, and the ancient world, as well as to general readers interested in the history of language, and in speaking the direct ancestor of the world’s largest language family. Buy at Amazon.com International . WebHelp version; simple, recommended HTML version with navigation help for online reading. FlashHelp version; like WebHelp, with a customized navigation help. Slower – Needs Adobe Flash! .CHM HTMLHelp file for download and read offline. .MOBI Version (v. 5.0) for Kindle and other reading devices. We would like our main works to be as accurate as possible, and to be translated into all possible languages, so that everyone is able to read it and learn MIE in their mother tongue. If you are interested in translating the text, please contact us first to see if there are other people already working. 16/7/2017 :: (v. 5.25) Minor changes, most of them by Antonio Enrique Lázaro Sahuquillo, marked when translating the Grammar into Spanish. 01/10/2012 :: (v. 5.2) Added the new version of the Proto-Indo-European lexicon, by Fernando López-Menchero. 25/9/2012 :: (v. 5.1) Multiple minor corrections to the grammar – especially the verbal system and syntax. 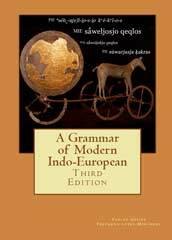 Please go to A Grammar of Modern Indo-European, Second Edition (outdated).